Gynecology is a medical specialty focusing on the female reproductive system. Regular gynecological exams are very important and can help prevent illness and discomfort. Our professional and caring providers at Women’s Health Care are dedicated to your gynecologic needs as well as your emotional needs. We will provide you with up-to-date and comprehensive evaluations to ensure your optimal health. 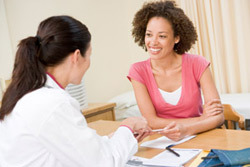 At Women’s Health Care, we focus on your specific concerns and needs. We listen to all your questions and concerns, forming a trusting relationship with each of our patients. Our all-female team believes in personalized care for every patient. We know the concerns of a woman in her twenties will be different from a woman entering menopause. As a result, we create custom plans for each of our patients. At your annual screening, we base your exam on your age, past health, and any concerns you may have. Dr. Epperson, Dr. Akiya, and Dr. Thompson all specialize in women’s health, focusing on creating a comfortable environment for each patient. We offer three convenient locations in Waukesha, New Berlin, and Mukwonago. Regular gynecological visits are an important part of your health due to preventative testing for diseases and irregularities. Pap smears are recommended once every three years to detect signs of cervical cancer and to screen for sexually transmitted infections. Women between the ages of 21-65 should have routine screenings to ensure you’re in optimal health, regardless of sexual activity. If any irregularities are detected, our caring team of specialists will diagnose and work with you to determine the best course of treatment. If you ever have any questions, or you are experiencing irregularity or discomfort, our team of board-certified doctors is available to answer and respond to any concerns you may have. We pride ourselves on building trust with our patients and we welcome any questions. Your health and reproductive well-being are our number one priority. We treat you with respect, providing the best gynecological care in Waukesha. Many women stop going for Pap tests and other gynecology services once menopause is reached. However, as you age, your cancer risk also increases. It’s important to continue to receive regular Pap tests and screenings through the age of 65. In addition to regular screenings, your OB-GYN specialist can also test for osteoporosis and recommend supplements and foods which will support bone health. Many women have questions about the changes their bodies undergo during menopause. We welcome any questions you may have, Waukesha Women’s Health Care gynecologists are here to listen and treat any concerns or problems you may experience as your body continues to grow and change. We treat women of all ages in our three convenient locations in Waukesha, Mukwonago, and New Berlin. Teens and young women need to take their health into account. Many girls believe cancer, diseases, and infertility are only a problem for older or sexually active women, yet this is not the case. Starting at the age of 21, Pap smears and annual exams are highly recommended. Early detection of cancer or any irregularities can help prevent complications or problems from occurring later on in life. Waukesha Women’s Healthcare provides our patients with a safe space; our doctors will treat you with respect and offer unbiased advice and treatment options. From contraception methods and options to the treatment of ovarian cysts and severe cramping or irregular bleeding, our doctors listen and personalize a treatment option which will best suit you. From annual appointments and screenings to the treatment of more serious issues, women of all ages have been relying on Waukesha Women’s Health Care. Our team provides the most comprehensive gynecological services and provides each of our patients with compassionate care. Dr. Thompson, Dr. Akiya, and Dr. Epperson possess years of experience, specializing in women’s reproductive healthcare. We treat everyone from adolescents and young adults to new moms and mature women. We have three convenient locations in Waukesha, New Berlin, and Mukwonago. Schedule an appointment with our friendly, caring team of practitioners today. We’ll ensure you’re in the best health, providing personalized care.